I'm lying on the floor of a long pastel-pink hall. 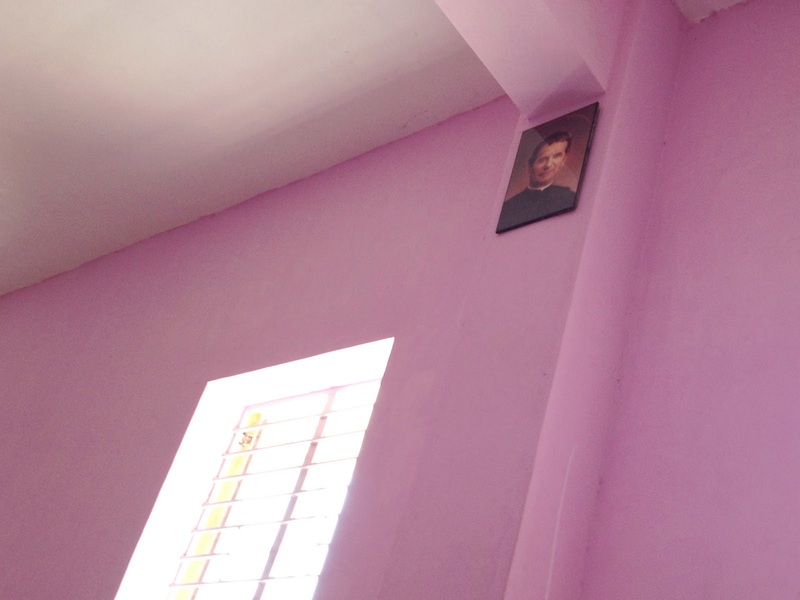 The room is lined with thin red sleeping mats, and the sole decor is a serene portrait of Saint Don Bosco. I'm trying to get comfortable below the maroon ceiling fan swishing above me. It's +44°C. Even the locals are praying for mercy, and talking about how gatherings should not be held during hot season. Today was the first day I heard Benny Hinn mentioned in a non-joking fashion. The lady who kindly loaned me her mat told me of a trip she made to see Benny when he came to the capital. "We had never seen a healing service... It was his first time in our country... Fifty of us went." I don't know what to say. So I make some simple remark, and stare as if distracted by the empty field in front of us. (Everyone's in the shade: chatting, eating, waiting for cooler weather.) I'm thinking, "Really?! Benny Hinn?" A few hours ago I was in an open-air building listening to this: “Enlarge the place of your tent, stretch your tent curtains wide...you will spread out to the right and to the left...." The teacher and his translator are speaking, "He wants more for you. He wants you to have abundance." I can't disagree. But after an hour and half of that, and heat, I took to a sleeping mat during the next session. When I start hearing "abundance" messages, I get wary. I can't help it; I grew up in a city where prosperity preachers sent the offering plate for a third round, and then sent their children to my school wearing different Nikes every day. And call me conservative, but I've never taken part in a healing service. After the fourteenth (OK, fourth) emotional, swaying repetition of the same chorus, I get tired. When I realized that the man at an event I attended was speaking in uninterpreted tongues, not the local language, I cringed. And Benny Hinn, well, do I need to even go there? "It is true that some preach Chr!st out of envy and rivalry, but others out of goodwill.... But what does it matter? The important thing is that in every way, whether from false motives or true, Chr!st is preached. And because of this I rejoice." I've known people who could go into extensive arguments about the frequency of communion services or whether contemporary music should be used in worship. Worse yet, I've seen people disturb the study of the Word by throwing in snide remarks about Book versions. In North America, where chu'rches come in endless flavours, we get particular. "I'd like a scoop of Pistachio Presbyterian" or "Could you mix some Reformed Raisins into my Baptist Butterscotch?" But here, so far, I've only seen one flavour: Charismatic Caramel. When our fellowship is fraught with reminders of our differing theologies, I have to humbly remember that they're more for us than against us. The reminders of our Oneness are everywhere, if I take the time to look. Here I see no amulets, no lucky eyeliner, no hearts full of fear of the spirits. No longer do they have to wait for an auspicious day to marry or move or start a new job; any day will do. I see a young man in green polyester trousers (a classic poor-man's cut), worshipping next to a man dressed in Western apparel. A middle class boy is squatting and cleaning the floor like a servant usually would. "That couple" seated behind me and their formerly-rascally son have transformed lives because someone loved them enough to face mocking and reach out to them. Each person here stands out from 99.5% of the local population; we have much in common. Back in the pink room of the rented Catholic facility, from my red mat under the fan, I notice one other ornament on the wall. A plastic J'esus, bloody and hanging on that cross. In the background, I hear the distant droning of the gathering I skipped. I wonder, have they learned the message of that cross? Between elaborately choreographed dances and messages about healing and abundance, is the beat up J'esus the one they truly follow? I hold over them my theology and study. But I didn't get beat up or kidnapped when I declared my stance. I didn't get reviled or threatened at school each day. I didn't go completely against the grain of everything my neighbours and family believed. My J'esus has straight teeth and coiffed hair. He is sweet and serene, his garments silky white, his smile peaceful. He's holding a scroll and waxing eloquent. But the sweating, suffering, bloody, beaten J'esus—they know Him better than I do. Thank you for sharing these thoughts. It is so easy in NA to think my brand of belief is the right one and all others are wrong. May He give you strength to share truth in love to these family members. And to patiently sit and learn from them. The serenity prayer seems appropriate in such situations. Blessings! I think that our time spent picking fights with other groups would be better spent going to places where there are no groups. You know? Takes a lot of humility, though, to remind yourself to learn from people that have such different ideas in some areas. And patience, to sweat through a 1 hour message for a few good tidbits. But He was so humble and patient to come for us! Can't wait till we are all with Jesus and our differences won't matter. When all we will see is the risen Jesus, the "He has Redeemed us Jesus" for the rest of eternity. He has not been on that cross for many years but aren't we thankful that He went there just for us.